"It's not that hard. You just have to use abilities they won't discuss and techniques they haven't entirely taught you via controls they never quite explain." Cousin to a Solve the Soup Cans puzzle, a Guide Dang It is any part of a video game in which that correct action or set of actions is so difficult to figure out from the game's own clues that, effectively, the only way to know what to do (aside from spending countless hours of trying every remote possibility until something happens) is via a Strategy Guide or an online Walkthrough. This is particularly necessary when dealing with random maze sections, determining Relationship Values, or trying to achieve 100% Completion (to avoid having anything Lost Forever). Do note that quite a few of these examples may have been placed as interesting finds for players that accidentally get into obscure situations or curiously muck around with the game, especially in older sandbox titles where groping around in the proverbial dark was an intentional part of the experience. Examples that are required to complete the game are still nasty, however. Most of these examples are basically just poor design where the manual or in-game instructions just fail to elaborate on somethings, there were often some more sinister versions where the developers wanted you to spend money by calling their hotline or buying their hintbook or Magazine. Now that GameFAQs is more common, this practice pretty much stopped. 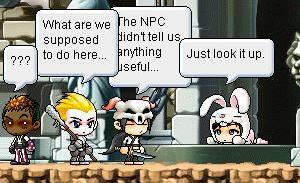 Contrast with Player Nudge, when the Devs are aware how complicated the game might have become and try to subvert it. Compare Moon Logic Puzzle, where the game does provide the information you need, but most players will still require a walkthrough to put it all together. Often overlaps with Metagame, which has new rules that are not written in the official books, making the game very annoying for new players. This page was last edited on 10 April 2017, at 20:40.